The DeMatha fast break is called Bingo, try to score in early offence, if they can't, get into offence. 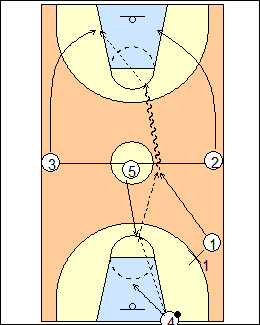 4 is the designated inbounder, he clears the backboard. 2 and 3 are the sprinters, 2 runs with his back to the right sideline, 3 with his back to the left sideline, they can see the whole floor, sprint down to the blocks then get out to the wings if they haven't got the ball. 1 gets open as far from the baseline as he can (not in the deep corner, where he can be trapped). They want 4 to be able to throw a baseball pass, and really encourage the point guard to throw the ball ahead. 5 runs the rim, but stops at halfcourt, looks back to see if they need help getting the ball in, if they're good he continues to run, if not he comes back to help. If 1 is overplayed he gets to the sideline then makes a diagonal cut as soon as 5 gets the ball (shown), X1 can't guard both, it's most likely a 3-on-2. See Fast break - DeMatha transition shooting. 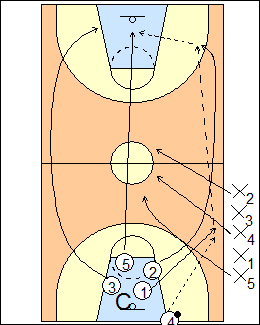 For Bingo recognition, coach scores the ball then five attackers fast break upcourt 5 on 0, coach immediately sends in up to 5 defenders, who can fullcourt press coming back, attackers must recognize their options based on who is being guarded. 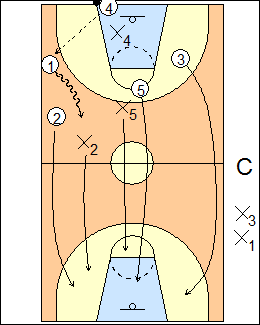 Here 1 is open for an inbounds pass against three defenders, come back 5-on-3 to a stop or score. - six trips, pitch it ahead going upcourt (see what they have), 1 is always denied coming back. See Fast break - 5-man weave vs transition D, 5 on 0 trips.